Now that Blu-ray has won the HD format now, this is one of the fist articles on Digital Digest dedicated to Blu-ray. But even had HD DVD not folded so quickly, this guide would still be a Blu-ray only guide. Why? Simple. It's because this guide is about how to make play Blu-ray movies region-free on your PC - there can never be a HD DVD equivalent of this guide because HD DVD is region-free. Is Your PC High Definition DVD Ready? Future versions of this guide will even features region-free instructions and tips for Blu-ray standalones, but for now, this guide concentrates on making Windows PCs region-free. Ok, let's start. Blu-ray has 3 different regions, which are different to that of DVDs. While DVDs use region numbering, Blu-rays use region lettering - the letters A, B and C represent the 3 regions of Blu-ray. Region A consists of North American, Central America, South America, East Asia (except for China) and South East Asia. Region B is Europe, Africa, Middle East, New Zealand, and of course, Australia (where I am). Region C is for everywhere else, but mainly China, Russian and India. As with DVDs, you can find the region coding information on the back of the movie cover. Note that not all Blu-ray movies are region coded. Movies from Warner Bros., and upcoming releases from Paramount and Universal will most likely all be region-free. Disney and Sony's catalogue title releases are usually region-free as well, and only their new movie releases are region coded. All Fox Blu-ray titles are region coded, even catalogue titles. The situation with Blu-ray computer drives is even more confusing than with DVD drives. Some Blu-ray drives do not have region locking in hardware (eg. some LG drives), while others are hard coded into the drive's firmware (eg. Matshita drives). All still carry the same DVD region locking system as DVD drives. As such, only the Blu-ray drives without hardware locking can be unlocked through the various techniques for software based players (PowerDVD, WinDVD) covered by this guide, so if your Blu-ray drive is region-locked, the instructions for PowerDVD/WinDVD will probably not work. On the other hand, if you do have a drive without hardware region-locking, then the solution is quite simple to perform in software. AACS is the copy protection system used on Blu-ray. If you bypass AACS, you can then be allowed to remove region coding as well during playback. Bypassing AACS is illegal, and as such, this website will not cover these instructions. Unlike the defeated HD DVD, Blu-ray also uses BD+ copy protection. BD+ is more versatile than AACS, and it can be changed on the fly to detect the absence of AACS, and so on titles that use BD+ (some Fox Blu-rays), the methods which bypasses AACS will not work. There is a new tool that, once you bypass AACS, allows you to strip region coding from the Blu-ray files. This tool can even strip BD-J based region detection. 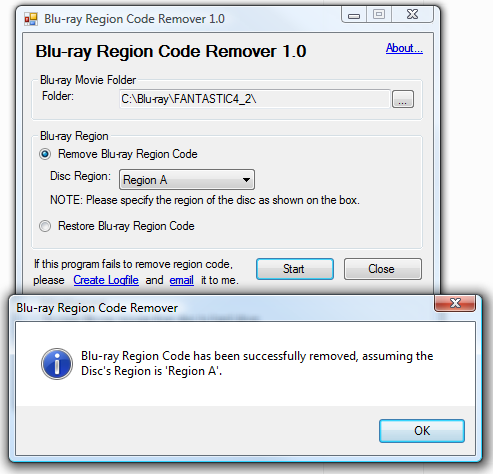 You can download the Blu-ray Region Code Remover tool here.